Do you ever get painters’ block? You’re not sure what to paint next, and nothing seems to be working? I’m lucky, meeting so many interesting people and creatures (yes, it’s often those wild things out there that give me so much pleasure when I’m out sketching), that it never seems to bother me. If you are finding it hard to get going again, you can try working on different surfaces – tinted papers, perhaps – or a different medium for a while, to trigger new sensations. Think also about changing subject matter. This can be totally different to your usual work, or simple extending it in a way, such as adding wildlife into the middle distance of your landscapes, or more detailed figures than you normally paint. While I mainly paint landscapes, the impact of stunning wildlife stumbling into my scene (and sometimes getting a bit too close for comfort) has encouraged me to paint more wildlife. Boats and the sea are also favourites, bringing a pleasant change to inland scenes, and I love doing figure work in various forms. Here, I’d like to talk about another type of subject I find fascinating – the industrial scene. When the coal mines of South Wales were closing down rapidly towards the end of the 20th century I wanted to capture the last of the mines before they all disappeared. 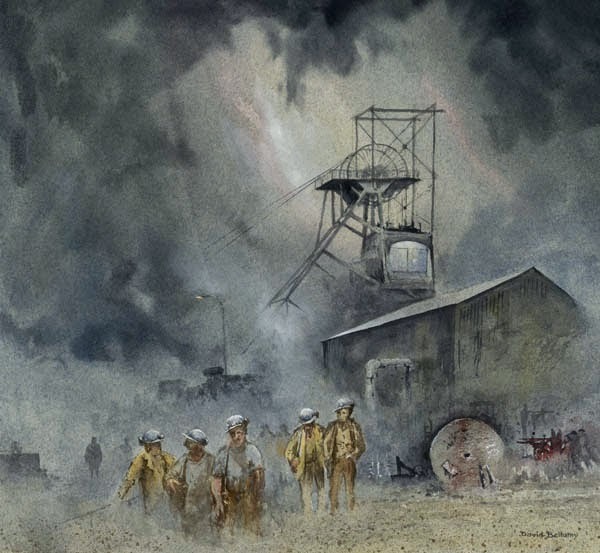 This is a watercolour of Penallta Colliery with the miners coming off duty. I didn’t want to include all the intricate detail of the pithead and environs so I introduced quite a bit of atmosphere. This also had the advantage of making the figures stand out against the background, and the whole composition was created from several sketches and photographs. This was especially important with regard to the miners who had to relate to each other. Here and there I have deliberately lost detail, but note how the smaller background figures in silhouette really suggest a sense of depth to the painting. There tends to be a lot of detritus lying around in a scene like this, but you don’t need to put it all in: some of it can either be simply suggested vaguely, or you could leave it out altogether. As always with a complicated scene it is vital to do at least one studio sketch before the painting, to work out the optimum composition. Consider also keeping the background as an almost monochrome as I have done here. This will further throw emphasis onto the foreground. 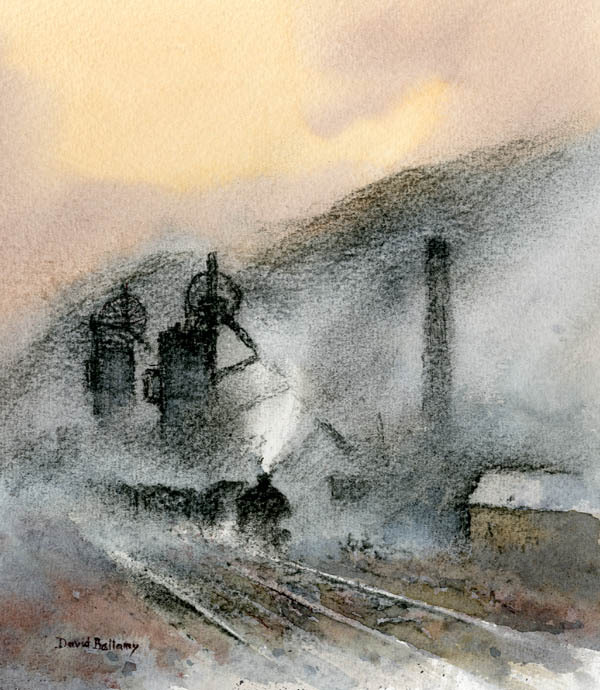 Unfortunately Images of the South Wales Mines, the book that resulted from my mining paintings, has long been out of print, but you may be able to get a rather expensive copy secondhand. Most of all, don’t let that painters’ block stop you – we all get a little stale at times, but trying a different type of subject is often a good way of rejuvenating your artistic impulses. I have always been fascinated by industrial subjects and they make an excellent change from landscapes, especially if you feel yourself getting into a rut. Many years ago I wrote a book Images of the South Wales Mines, and did quite a lot of work in and around the mines at the time when they were being closed down as the government of the day wrought its vengeance on the mining industry. Now all deep mining has ended in Wales and I have been working on a few more paintings of this vanished era. The painting is a watercolour and charcoal work of Marine Colliery, Cwm, showing a coal train getting up steam. When it comes to painting industrial subjects I am a great fan of dirt, dust and steam, as it not only can create instant atmosphere, but can hide the bits you don’t want people to see. This is especially useful where you are painting a scene that no longer exists, and are not sure about what exactly went where! While this was not true of the painting depicted, I have used the ploy in other situations, so if you are painting such scenes do make full use of the dirt and dust. This is one of a collection of paintings that will be on display at the Corner House Gallery at 38 Quay Street, Ammanford in Carmarthenshire. Tel. 01269 594959 They will be exhibited from the afternoon of Thursday 4th August onwards, and I shall be there on that afternoon, so do come along and have a chat. To see some of the paintings in the collection click here.